It is the autumn term and Greer MacDonald is struggling to settle into the sixth form at the exclusive St. Aidan the Great boarding school, known to its privileged pupils as S.T.A.G.S. Just when she despairs of making friends Greer receives a mysterious invitation with three words embossed upon on it: huntin' shootin' fishin'. When Greer learns that the invitation is to spend the half term weekend at the country manor of Henry de Warlencourt, the most popular and wealthy boy at S.T.A.G.S., she is as surprised as she is flattered. I received a copy of this novel from Net Galley and Hot Key Books in return for an honest review. I've heard loads about this novel on Twitter and among other YA bloggers, so I was super excited to get my hands on a copy to review. I wasn't disappointed at all! 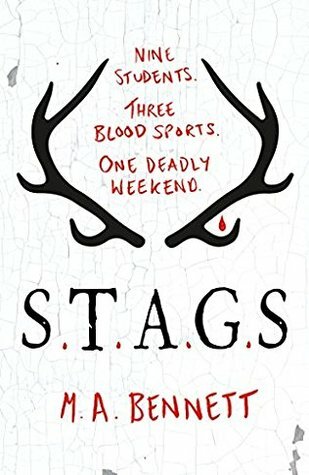 This is a fascinating and unique YA thriller that will keep you reading until the last page! This novel is set in an English boarding school, I'm a sucker for anything set in boarding schools, so if you have any other recommendations let me know!! There's something magical and so different about boarding schools, maybe it's because it's something I've only experienced through books and tv so it has a real novelty to it, but whatever the reason I can't say no to books with that setting. Bennett does an excellent job of setting up the boarding school and the scenario within the school quickly and efficiently so the storyline can get going as quickly as possible. Bennett's writing style is well suited to these quick paced novels, her descriptions are brief but essential, and characters are developed well, without sacrificing the quick pace of the plot. This novel utilises a past tense narrative, with our main character Greer seemingly telling the story from the future, adding another layer to the mystery and adding the reliable/unreliable narrator theme into the novel. More of the story becomes clear as we read; Greer has the whole story, but she only drip feeds the details to the reader, so we are left wondering exactly what has taken place, and it's not completely clear until the very end of the novel. The mystery in the novel is also well written, Bennett keeps the reader guess into exactly what has taken place until the very end, and even when you think the action has finished, Bennett throws in another twist just to keep you on your toes! It's a fast-paced and twisting story that will definitely keep you reading until the last page. Overall I really enjoyed this novel. Bennett writes an amazing YA thriller, check out her other novel The Island for something more Hunger Games-esque but just as action packed!